I’m excited! In a few hours I will get my hands on the LEGO books I mentioned yesterday. And more good news: I was beyond thrilled that Brendan Powell Smith has been replying to my queries. It was a simple correspondence through Facebook but I’m happy that he responded. I decided to give the books to my nephew Nav. We’re going to Bangkok and I haven’t bought any gift for him. He loves Lego too and recently, he has shown interest in reading the Bible and devotionals according to his dad, my brother-in-law, who is also a pastor. I know he’d love them. I wanted to get signed copies of the books, greeting cards, and posters. I will order The Brick products before December. I’m still deciding whether I’d have the items shipped straight to the Philippines or to a friend who is in New York. I’m not sure if the books will be available locally but I’m sure they’d be more expensive as with the case of the Noah’s Ark book. Many of my friends have also expressed their excitement and they think that the books are a great way to get kids (and some adults) too read the Bible. I love Brendan’s work because it’s Lego and the Bible. Two of my favorite things in the world. Last week, The Chicago Tribune’s Redeye blog published a full review of The Brick Bible. Hufftington Post also picked up the story and featured The New Testaiment in LEGOs. 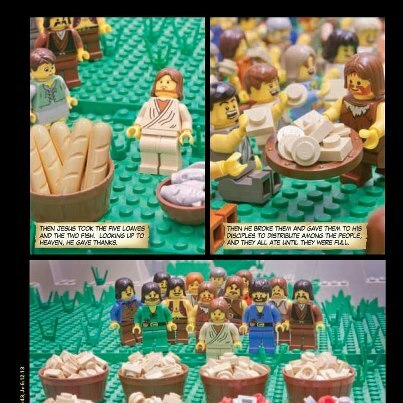 The Brick Bible also made it to TIME: The Brick Bible: Turning Jesus Stories into Lego Scenes. I am hoping this LEGO Bible would lead more people to Christ. Who knew even toy bricks can be used to advance God’s Kingdom? Mixed reviews of The Brick Testament but we’ll see. I shall post a REVIEW once I’m done reading them. The Christmas Story: The Brick Bible for Kids Now Available!